Many visitors to Yellowstone National Park don’t realize that the boiling hot springs and spraying geysers are caused by an underlying supervolcano. It has erupted three times in the last 2.1 million years, and it will erupt again, changing the earth forever. Fifteen-year-old Alex is home alone when Yellowstone erupts. His town collapses into a nightmare of darkness, ash, and violence, forcing him to flee. He begins a harrowing trek in search of his parents and sister, who were visiting relatives 140 miles away. Along the way, Alex struggles through a landscape transformed by more than a foot of ash. The disaster brings out the best and worst in people desperate for food, clean water, and shelter. When an escaped convict injures Alex, he searches for a sheltered place where he can wait—to heal or to die. Instead, he finds Darla. Together, they fight to achieve a nearly impossible goal: surviving the supervolcano. Tracy: I’d like to talk with you from a writer’s perspective. Once you got the idea that you wanted to write about the supervolcano, how did it evolve for you? How do the ideas come? How do you work on getting those ideas? Mike: The idea came from reading another book, Bill Bryson’s “A Short History of NearlyEverything”, and I thought Ah ha, supervolcano. I’ve always been interested in disaster fiction. I’ve been an avid reader of apocalyptic fiction all my life and I thought here’s an apocalypse. I’ve always shied away from writing about one because it seems like they’ve all been done, and done well. I mean if I want to read a great book about tsunami’s or tornados, or what have you, it’s out there. Plenty of volcano stories out there. So the supervolcano, I thought that maybe no one has written about that and it turned out at the time that I had the idea nobody had. Now there a couple books about super volcanos which is fine, of course. T: After yours or before? M: After. Mine is the first and now Harry Turtledove has a novel titled “Supervolcano: Eruption,” which is an adult novel. T: Do you think your book was part of him writing his novel? M: No, just a coincidence. They were in the pipeline at the same time. It came out only two months after ASHFALL. He got the idea from watching the national geographic special on it. He probably started writing his about a year or two after I started ASHFALL. I read lots of YA (young adult) and I’ve always read YA, so it felt very natural for me to write in that genre. From there it was just a matter of thinking, okay, so I need a teenager and I needed to put him in a situation where his parents wouldn’t be around, because I don’t want the novel to be about the parents. M: Exactly. So the idea of having his parents be visiting relatives just flowed naturally from that, from trying to figure out how to structure it to be a good YA novel. As far as finding the idea for the teenager that really came from my research. I did tons and tons of research on volcanos, obviously, but I also knew that I needed my protagonist to have some kind of special ability, something that was special about him to be able to survive this horrible, horrible natural disaster I was going to put him through. But I wanted to write realistic fiction. I didn’t want to have any magic. I thought that the way I would make my book different from all the dystopian novels I’ve read would be by making it intensely realistic. Something that could happen and would happen. So I decided that my main character would be a martial artist. The only bad part was that I didn’t know any martial arts. So I started taking Taekwondo and I thought I would just take it for a while, but it turned out I really enjoyed it and stuck with it and finally earned my black belt just before ASHFALL came out and now it’s a big part of my school presentation. T: Which is really great! M: Yeah, I break blocks! Its fun. T: Which is kind of amazing when you think about it. M: I enjoy it. I like breaking stuff, what can I say. Also, I met there (at the Taekwondo Dojang), Ben Alexander who’s this fifteen year old third degree black belt. This was back when I was just a white belt and he was really patient and would explain things over and over again. Just a really great kid. He’s kind of small – he comes up to about here on me (indicates mid chest). I’ve got probably 80 pounds on him and tons of reach. He’s so friendly and helpful but then we have at our dojang what we call Friday night fights. We strap pads on our hands and feet and chest protectors and helmets and then we try to kick the crud out of each other. It’s awesome! Ben Alexander can pretty much kick me in the head and knock me down any time he wants to. He’s that much better. Even now, he’s still a third degree black belt, and I have my black belt now, but he’s just so much faster. I thought, ah ha! That’s the guy I need to have in my mind as I’m writing my character and that’s why my protagonist in ASHFALL is named Alex after Ben Alexander. I don’t know why I didn’t like Ben (the name, not the boy! ), but he didn’t feel like a Ben to me so I used Alex. T: So do you find that ideas just sort of pop into your head; that they come to you that way? And when you’re actually starting to write – let’s talk about that, too. Do you do an outline? I know one author says he throws all the ideas into a box and then takes it out and storyboards it. What’s your process? 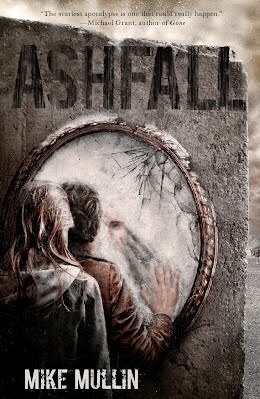 M: Before I wrote ASHFALL, I had a YA horror novel that I ‘pantsed’. I had the idea and the characters and just wrote it as I went and figured out where it was going as I was writing. (Mike’s wife, Margaret sees my confusion about the term ‘pantsed’ and interjects ‘By the seat of your pants’ to clarify for me. I am obviously not up on writer jargon!) And that novel was so bad that I sent it to three literary agents and two of them quit the business forever! When I was doing ASHFALL, I actually plotted it out. I wrote a very rough, chaotic five page outline before I started writing. And planned things like here’s how I’m going to get his parents away and planned it basically all out. Darla was in that outline. T: How true was it? M: To what I actually ended up writing? Not very. I wound up diverging from it. And some of the best parts of the novel are where I allowed myself to diverge from the outline. Many people tell me that their favorite part of ASHFALL is chapters 37 and 38 and when I’m asked, I usually say chapters 37 and 38. T: Tell me what happens in those. M: It’s when Alex and Darla meet Katie and her mom on the road. T: Is that with the little girls in the snow suits? M: Yeah. Exactly. With the blond hair. They were never in any outline, or any plan. I wrote that while I was out in Portland visiting my uncle Chuck who was then dying of stage four colon cancer. When I’m drafting, I try to write absolutely every day. So I would get up in the morning at 5 or 6 and write for a couple of hours until my uncle Chuck would get up about 10 or 11am. He’s very sick at this point. He died two weeks after I left. Then I’d put my writing aside and spend the rest of the day with my uncle Chuck. The thing that affected me most deeply about that wasn’t so much watching my uncle Chuck die as watching his family around him; his kids and his wife who were just trying to shower love on him even while they are obviously already grieving; deeply into this grief process. And so I think from that I wrote this woman who had just lost her husband and was trying to protect her children and found that she couldn’t. I know that really worked because one of the revision techniques I use is to either read my work aloud, or better yet, have it read out loud. And so I’ll volunteer to drive Margaret, my wife, to her education conferences. So I’m driving her to this education conference in Pittsburg and she’s reading the draft of ASHFALL out loud in the passenger seat – because it’s really better if you don’t read and drive. T: Yes, I’ve tried it, but not a good idea. M: And I hear this little noise and I look over and she’s doing this kind-of quiet crying thing and there’s just tears streaming down her face and I thought, YES, I’ve nailed it! I’ve made my wife cry. I’m a great writer and a terrible husband. T: (Laughs) But that is exactly what you want. You want to get that emotion. So when in the writing of ASHFALL, or maybe it wasn’t during the writing, did you start getting ideas for the sequels? M: Actually when I was doing the outline, before it was ever written, I had a rough idea. I realized that I had way more story than would fit in one book, and that ASHFALL would probably work best if it was really tightly compressed. ASHFALL takes place over six or eight weeks; just a real short snapshot of Alex’s journey and I really wanted to end on a real note of hope where the reader would have some confidence that Alex had a future. And the volcanic winter after an eruption like I’m depicting is going to be brutal and at least three years, possibly as long as ten years. So I couldn’t finish on that sense of hope that I wanted. So I did do a very rough sketch of this is what belongs in the second book and this is what belongs in the third book and as I was drafting ASHFALL and ASHEN WINTER I would keep track of the things that didn’t fit and I kept outlining SUNRISE, the third book, off and on all through the process. When I actually sat down to do the outline to send to my publisher to sell SUNRISE, it was just a matter of putting everything place. Formalizing it rather than creating it. So I’ve had a rough arc for the trilogy since before I wrote ASHFALL. T: Do you find that while you were writing ASHFALL that you wanted to start writing ASHEN WINTER? M: Oh, all the time. Ideas come all the time. You get random ideas. You think ‘here’s this really cool idea, I should go write this.’ The way I deal with that is I open a new file on my computer and I write down everything I know about this shiny new idea and then I go back to work. Because you can’t sell an unfinished novel! So the nice thing about that is that I have fifteen or twenty of those little files with chunks of novels or ideas. Some of them are just a few paragraphs and some that are ten or fifteen pages with scenes all written out. When I finish the ASHFALL trilogy I’ll open them up and see which one I’m most interested in writing next. T: So you don’t have writer’s block most of the time. M: No, there are definitely days when I have trouble with that, absolutely. What I typically will do – what works for me – it to get out of the house, go for a bike ride, go for a walk, get some kind of physical activity. Sometimes sitting down in an unusual place. I’m a nomadic writer. Anywhere where I’ve got my lap top, I’ll sit down and write. Sometimes I just walk into a new place and sit down and start typing. T: When I do talks, one of the things that I always say is that imagination is really the most important thing. Einstein said it – of course you have to be able to have a good craft – but having the idea is the key. So any words of wisdom to pass on to writers or people wanting to be published? M: All I really tell students in my talks is read a lot, write a lot, submit or self-publish your work. It’s that easy and that difficult. Michael Grant says sort of the same thing. I heard his school presentation a few weeks ago, except he says ‘Live a Lot’, so that you can have something to write about. T: Right, like Margaret (McMullan) said, it’s boring to write about someone sitting in a room alone. T: Okay, great! Thank you so much!